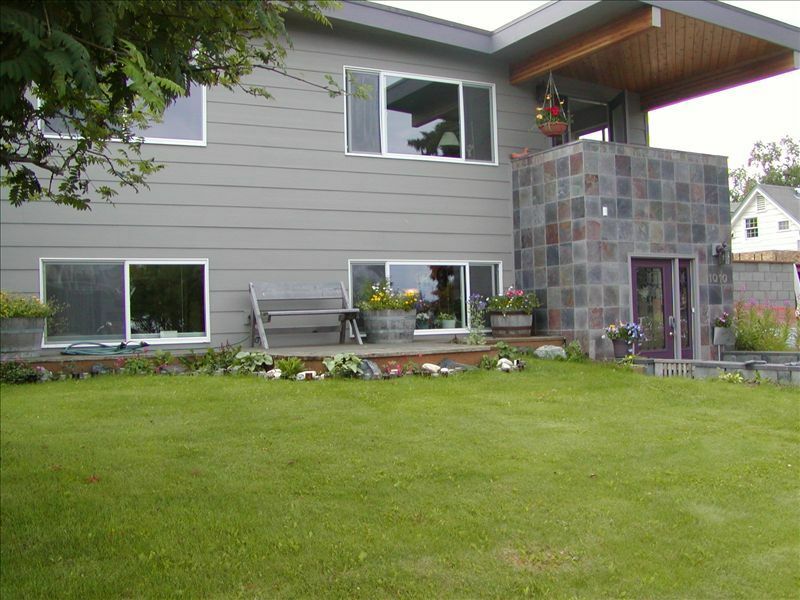 Ten Ten on the Green, an efficiency style suite with a kitchenette, queen bed and private en-suite bath with shower is an Anchorage Downtown Vacation Rental in a private home. A self serve breakfast is provided for your first morning. It is located on Delaney Park Strip, where the wide open lawns were cleared as a firebreak for early Anchorage, it later became the main airfield. Today it is the site of many local activities and events. Ten Ten on the Green is within walking distance to downtown activities and attractions, specialty shopping, museums and galleries, a wide variety of restaurants, the Alaska Railroad Depot and city bus stops, parks, trails, The City Market and our favorite, Fire Island Bakery. Being in the heart of a city surrounded by wilderness will provide you with opportunities for many getaway adventures. After a day of sightseeing, fishing, hiking, or your personally planned Alaskan adventure, enjoy a dinner sampling the cuisine of the north. In the land of the midnight sun you will still have time to take a leisurely walk along the Tony Knowles Coastal Trail, take in some of the city's nightlife or just relax in your own warm, comfortable suite. The Unique Benefits at this Studio: Enjoy the benefit of sharing your visit with 'real' Alaskan folks and still have the privacy of your own home-away-from-home. Mercy and Elliott are working professionals. They enjoy welcoming Alaskan visitors to Ten Ten on the Green. Elliott moved to Alaska in 1956 and grew up in Southeast Alaska, and he and Mercy moved to Anchorage in 1976, after having met in graduate school. During the summer Elliott enjoys finding time to float Alaska Rivers in his 'blue rubber boat' and Mercy hangs out with her flowers and veggies in the yard or greenhouse. Their home is often a gathering place for friends and their multigenerational family. Also, their two Chihuahua kiddos, Poca Luna and Kimber, share their home; although, they are not allowed in the guest's private suite. Location, location, location. After Mercy and Elliott's children left the nest they decided to move from their family home and purchased a small 4-plex in downtown Anchorage. In 2004 they remodeled the 4-plex into a single family dwelling with a mother-in-law apartment. At that time they decided to share part of their home with interesting folks visiting Alaska. They love living in the heart of the city. The unit is on the entry level. The doors are regular size as is the bathroom access. This is GREAT place to stay in Anchorage. I don't know how it could have been any better! (We stayed for three weeks). My boyfriend and I loved our stay here--Mercy and Dennis were extremely welcoming and the studio was very clean and thoughtfully furnished, definitely designed to be accommodating to guests (really appreciated the little details like empty shelves next to the bed and in the bathroom, small disposable cups for bathroom sink, etc). There were also many useful brochures about Alaska and the area. Additionally, there were some breakfast items stocked in the fridge + fresh pastries for the next morning! The location is also perfect, walking distance to downtown food, Tony Knowles coastal trail, train station, etc. We arrived here after a long overnight flight and were quite jetlagged. I had sensibly booked the night before we arrived so that we could just drive straight there from the airport and crash out and sleep for a few hours. Mercy was kind enough to leave notes on the outer and inner doors to ensure that we found our way without any problems, but she had also supplied such excellent directions and instructions that we almost didn't need the notes - but they were a welcome reassurance anyway. This is a lovely place to stay and very well set up with an excellent range of appliances, dishes and glassware. It was like a little home away from home, very comfortable and so close to everything that we could have walked everywhere if we had wanted to! There were lots of little goodies left for our breakfasts - including some awesome muffins from Fire Island Bakeshop - which were so good we had to visit the bakery and buy some more. It is also close to the Sagaya City Market, so it was easy to stop off there on our way back home and buy provisions for dinner - because the apartment has a great little kitchen which made cooking meals such a pleasure. The Sagaya City Market also does good coffees - they actually have a barista so for an Aussie traveller this was quite a treat. This apartment has lovely windows looking out over the gardens and we were lucky that spring flowers were just starting to bloom so it was bright and colourful. It's also a big advantage that you can use the washing machine and dryer - always a help when you're travelling. I should also mention that you also have a place to park your car out the back off the laneway. Mercy also had a lot of travel information available on the bookcase - lots of books, brochures and DVDs. I would highly recommend this as a place to stay if you are visiting Anchorage, it is so well set up that you will be glad that you stayed here and not in a hotel. We loved our stay there, and would definitely stay there again. We loved Alaska so much that we are already planning a return visit, so a special thanks to Mercy and Elliott for making this such a wonderful place to stay. Context: first visit to Alaska, first time VRBOer, traveling without wife and kids (so did not have to stay in usual spousally-mandated $350+ hotel room). Location: central, 10 minutes from airport, walking distance to downtown. ONE BLOCK walk from 1010 to get shuttle to marathon start. You only have to stagger ONE BLOCK from marathon finish line in Delaney Park to 1010. You will have a reserved parking space. Hosts, an attorney and marriage counselor, are exceptionally pleasant, calm and anxious to make sure you are comfortable without being at all overbearing or in your space. Separate entrance so you can come and go as you please. Hosts freely shared glasses of wine and some wonderful home-smoked salmon (best I have ever had and I've had a lot). The suite...larger than the photos indicate...is very clean, fully outfitted with appliances, dishes, cookware, etc. It was really nice to arrive and see that fridge had diet cokes, OJ, water, Brie, butter, jam, etc., also fresh muffins and loaf of fresh bread. Very comfortable, no complaints. I cooked three meals. New Sagaya's City Market is a great grocery store/deli/coffee shop, 2 or 3 blocks away, it has most everything you will need including prepared foods if you would rather eat in but not cook. There is a nice stand up shower but no tub (which I originally "wanted" for dreaded post-run ice bath, but I discovered that you get same recovery if you keep moving for a couple hours afterward). Plenty of DVDs if you need entertainment, helpful books, magazines about Alaska. It was strange to have to pull down window shades to sleep, to block the sunlight at 11 p.m. There is large counter/desktop that is very handy to eat on, spread out papers, etc. Nearby hotels....Clarion, Sheraton, Hilton, Captain Cooks....all may have been nice when they were built in the 70s or 80, but not now. Just run down and the kind of places you would stay only if you had to. So 1010 is a no brainer. Alaska is now one of my favorite states and I would stay again at 1010 if I get to come back. A true "Home away from home"! This was the perfect location for us and a nice short walk to downtown Anchorage. Upon our arrival, we found all the things we needed to start our morning along with lots of extras we did not expect. We loved the local bread and hand made soap. The owners thought of every detail. It was a lovely quiet efficiency suite that we found very clean, cozy and comfortable without being too small. The bed was very comfortable and we both slept so soundly the entire stay. Thank you Mercy and Elliot for your warm hospitality. Mary & Larry from Florida. Across the Street from the Delaney Park Strip and within walking distance to downtown Anchorage. Touch up housekeeping services are weekly for 7-14 day stays. Touch up housekeeping services are bi-monthly for 30+ day stays.